It provides a place for kids with all types of abilities to play baseball together (WMML website ) on a field with a surface suitable for walkers, crutches, powerchairs, etc. The league accepts children age 5 and over and this is the first year the WMML has hosted a spring season. Opening Day landed on Saturday, Apr. 26 and although the day held a brisk wind, the sun shone brightly on the field. Cam was eager to get into his orange Astro uniform complete with his name emblazoned on the back. For a kid who has never liked to wear a hat, Chris and Jane were pleasantly surprised when Cam not only wanted to wear his Astros cap, but kept it on for the entire game! Each player swings a bat until they get a hit, so everyone gets a chance to make it around the bases. Chris hung out with his son on the field, while Jane snapped pics and talked to friends who had kids on other teams. What a fun first game and we look forward to the others! That same afternoon, Jane and Cam headed over to an open house for one our GVSU students, Ashley. 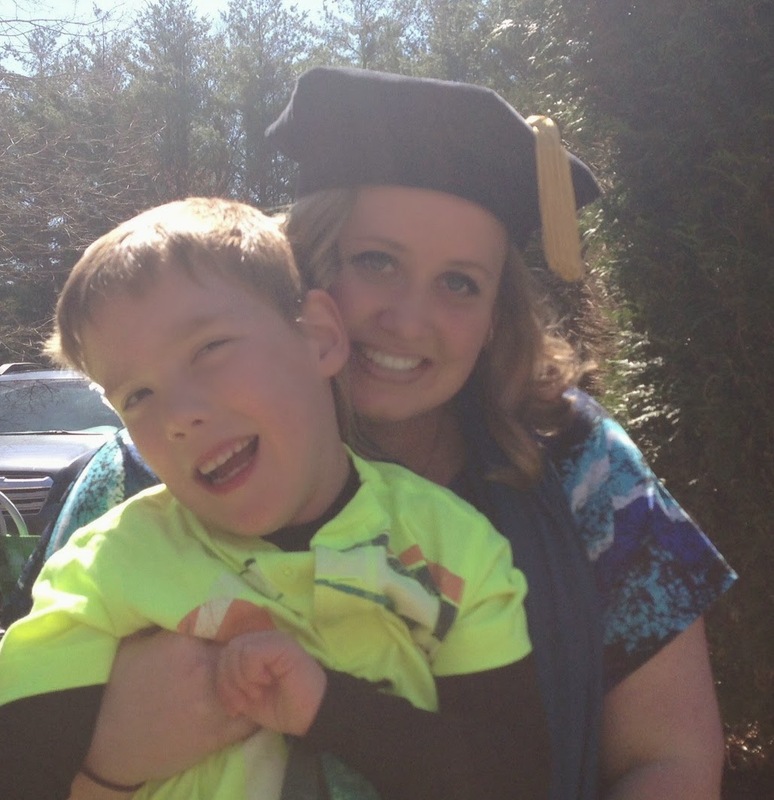 Ashley has known Cam for two years and just received her Doctorate of Physical Therapy. It's quite a humbling feeling to arrive at a celebration where everyone seems to "know" Cam before they've even met him. Ashley's mom had some of Cameron's fav snacks on the ready. We're excited for Ashley to start the next chapter of her life and we feel fortunate that she'll always be a part of ours. The weekend activities continued on Sunday with a birthday party for Cam's good buddy, Liam. Although these two friends don't get to see each other that often, it's always a great time when they get together. Liam's family and friends met at a park with a playground and although the weather started out shaky, it was a beautiful late afternoon. It's a tough call who enjoys playing together more...the kids or the parents. Although our two families have only known each other for 4 years, it seems more like a lifetime as we've shared in celebrations as well as life's ups and downs. At the heart of it all, this is what speaks to both of our families: "Children with disabilities aren't given to strong people, they're given to ordinary, everyday people. Raising a child with different abilities doesn't take a special family, it makes a family special."